In my humble opinion, sheet pan meals are nothing short of culinary magic. 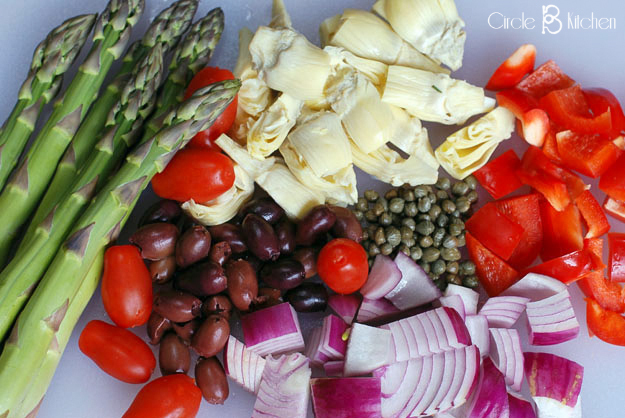 I mean, you throw some ingredients – in this case, artichoke hearts, kalamata olives, red peppers, tomatoes, asparagus, onion, capers and shrimp – into the pan, add seasonings, roast in the oven and then let heat and time create flavors and textures that were previously nonexistent. And then you’re done. Easy, delicious to the extreme, and well, rather perfect. In my humble opinion. I saw the good folks on The Kitchen create this particular sheet pan meal and knew instantly that it needed to be re-created in the Circle B Kitchen. Like now. And when I say “re-created”, I sort of mean that literally. I knew right away what I wanted to change and how I thought it could be made just that much better by subbing out green beans for fresh spring asparagus and red peppers for the tomatoes, although in this version, I did throw in some little tomatoes and loved them. So both tomatoes and peppers. The other awesome change I made was to marinate the shrimp and veggies in some of the herb and garlic oils I’ve been so persistent in using for like everything these last few weeks. But those changes were extremely successful, and I think upped the magical quotient by several degrees. The only thing better than a one-pan meal is a one-pan sheet pan meal. There's just something about oven-roasting that transforms your food into something altogether new and tasty. I made some changes to the original recipe, including the use of my herb oils, but you can click on the link above if you would like to peruse the original. 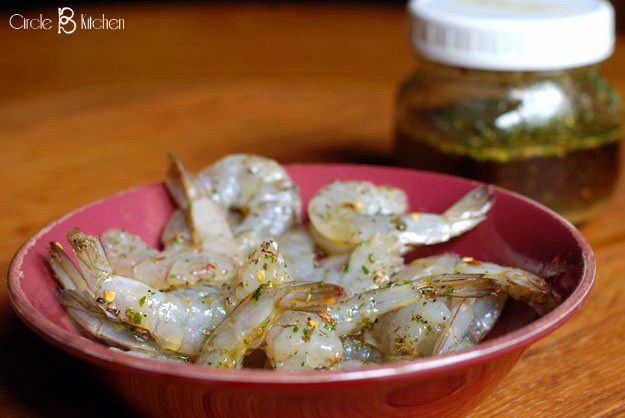 If you decide to use the spicy garlic oil for the shrimp, you can omit the other seasonings listed and just add the lemon. You will not be disappointed. For the vegetables: In a large bowl, whisk the white wine, olive oil (or herb oil) and garlic. 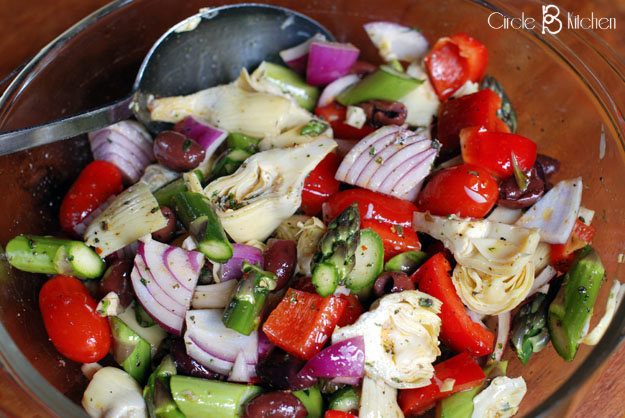 Add the artichokes, asparagus, red bell pepper, olives, capers and onions and toss to coat. Season with about 1/4 teaspoon each salt and pepper. Transfer the mixture to a baking sheet and evenly spread out. Roast for 10-12 minutes. 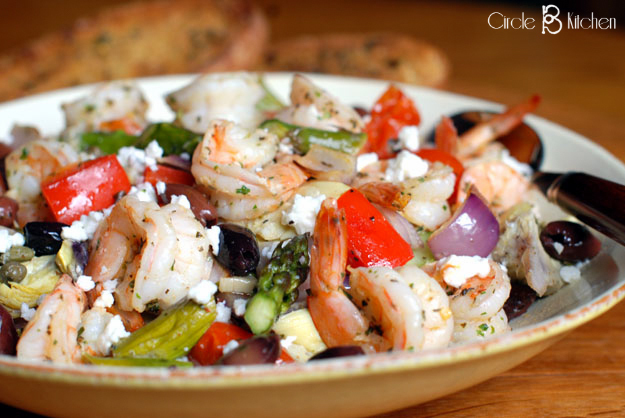 For the Shrimp: While the vegetables are roasting, use the same bowl that you used for the vegetables to mix together the olive oil (or Circle B spicy garlic oil or herb oil -see headnote), oregano, red pepper, garlic and lemon zest and juice. Add the shrimp and toss to coat. Season with about 1/4 teaspoon salt and a pinch of black pepper. Remove the baking sheet from the oven and add the shrimp. Stir and evenly spread out the shrimp and vegetables and roast until the shrimp is pink and opaque, about 8 minutes. Transfer to a serving bowl, sprinkle with the crumbled feta and serve with a loaf of crusty, fresh bread.